The British Museum has reopened some of its most popular galleries after nine-months of refurbishment. 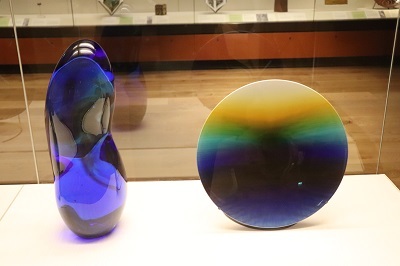 The Mitsubishi Corporation Japanese Galleries opens to the public again on 27 September 2018, displaying highlights from the Museum’s extensive Japanese collections. 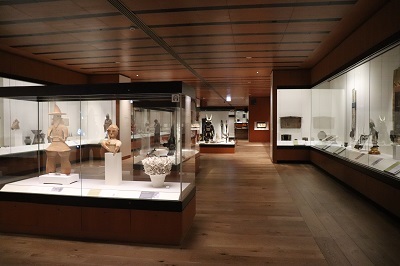 The galleries have seen major improvements to their design and infrastructure which considerably improve the display of some 430 artworks and archaeological and historical artefacts dating from ancient prehistory to the present day. Several major new acquisitions will be on display in the galleries for the first time. 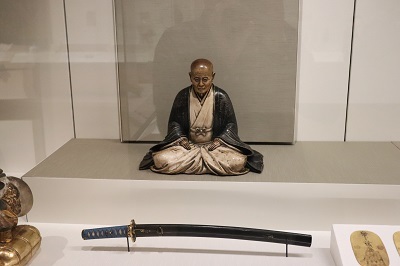 The centrepiece is the newly-acquired Edo period set of Samurai armour. 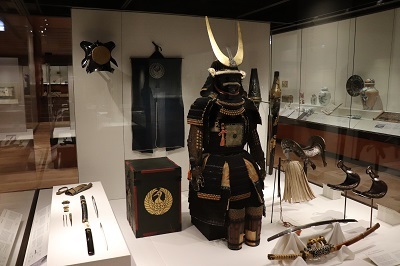 Made in the 1700s, this complete set of armour bears the crest of the Mori clan, who were an influential family of samurai lords who ruled in both the Akō and Mikazuki domains, Harima province (modern Hyōgo prefecture). The armour was intended more for ceremony and display than for battle. This set comes with important accessories such as the battle surcoat (jinbaori), ceremonial fly whisk, and original lacquered storage boxes. Another new acquisition will greet visitors on their arrival: Time Waterfall – panel #8 (Blue) by Miyajima Tatsuo (b. 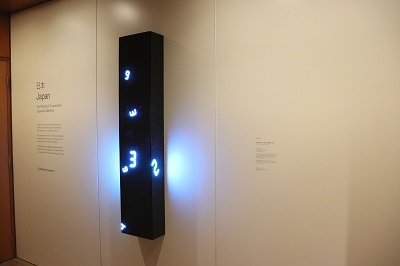 1957) is a contemporary artwork which consists of randomly generated digital numbers which tumble down an LED panel. 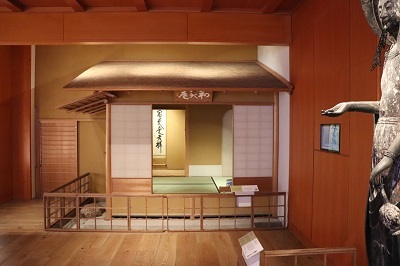 Time Waterfall will be permanently displayed in the introductory area of the galleries next to a sculpture of Bodhisattva Kannon from about 1930, and the Urasenke Foundation teahouse. 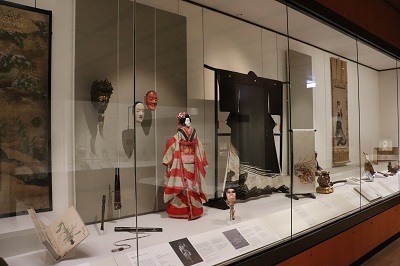 The galleries are full of remarkable objects including the Portrait of a retired townsman 1670-1790s, a number of masks and costumes used for Nō drama, Courtesan reading a letter By Kitagawa Utamaro 1805-6 and many more. Many sections of the galleries have been revised. 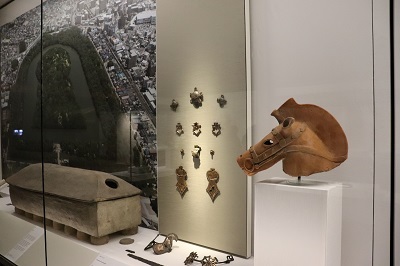 These include displays relating to the prehistoric periods of Jōmon (13,500 – 500 BC), Yayoi (500 BC – AD 250) and Kofun (AD 250 – 600) which draws on recent collaborative research among the British Museum, The Sainsbury Institute for the Study of Japanese Arts and Cultures (SISJAC) and leading archaeologists in Japan. 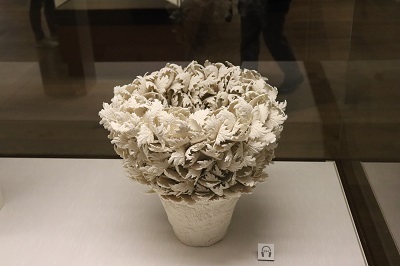 The modern galleries provide remarkable examples of more recent works, Dawn, 1992 By Tokuda Yasokichi III is a stunning piece of Kutani ceramic, ‘Spirit Reborn’ (Kewtum kanna-suy) By Kaizawa Tōru 2017 is an intricate wooden owl chick pecking through its shell and encountering the world for the first time and Large feather leaves bowl, 2013 is by Hosono Hitomi who painstakingly attached over a thousand leaves to give the impression that they are gently rustling in the wind. The stunning Japanese Galleries are some of the most popular in the British Museum, with around 5 million visitors in the past decade and a walk around the galleries provide a fascinating snapshot of Japan past and present. 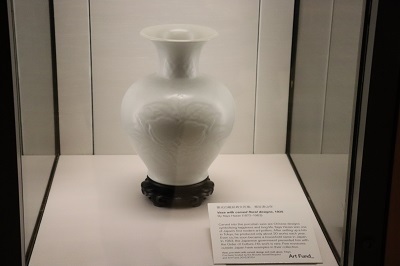 The recent additions have added to an already fascinating display which often explores little known aspects of Japanese history and life. By londonvisitors2014 in Exhibitions on September 26, 2018 .